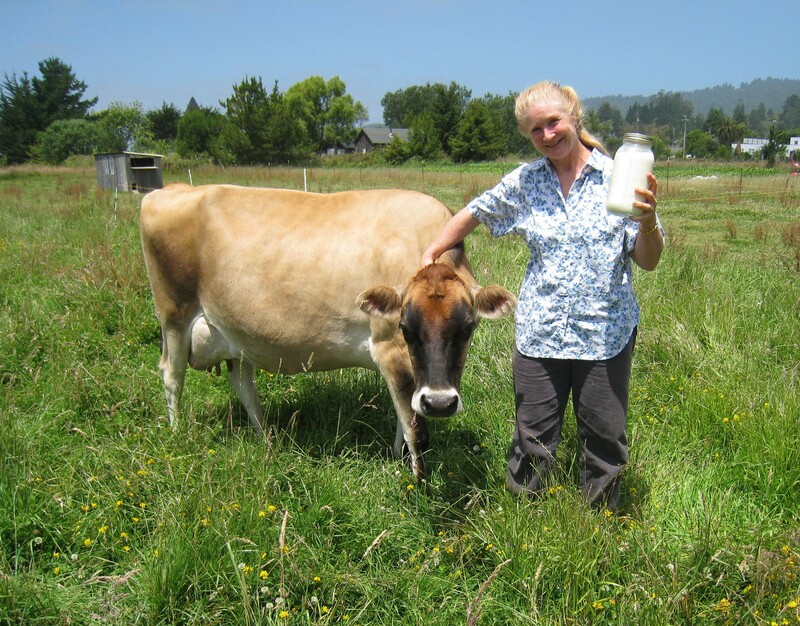 Urania Hunter buys her raw milk from the owner of Daisy Mae, of a Humboldt County pasture. Urania Hunter, of Eureka, loves, loves, loves milk. "It's the first food for me," she said, over the phone, one day last week. "I just love milk. It's my favorite food." "It's the most wonderful milk on earth," Hunter, who drinks a quart of raw milk a day, said. "It's just absolutely delicious. And there's something about this area that produces wonderful milk -- the fresh air, the green pastures, the type of rain." Hunter is among an increasingly adamant group in the county -- 2,200 signed a petition recently -- that wants the sale of raw milk to be legal in Humboldt. They say it would open up new venues for small dairies, as well as provide standardized guidelines and routine inspections for producers, thereby increasing the safety factor. This Thursday, at 6 p.m., raw milk advocates are sponsoring a "pep rally" and lecture at the Northwest Institute of Ayurveda, in Arcata. Then, on Aug. 23, there will be yet another rally at the institute; the next day, Aug. 24, they'll descend on the county Board of Supervisors meeting to push their cause: to convince the board to rescind county code 512.4, which prohibits the sale of unpasteurized liquid "market" milk products for human consumption. Actually, Hunter convinced her supervisor, Bonnie Neely, to allot the raw-milk drinkers a 9:30 a.m. slot to present their case. Neely, earlier this week, said she would invite others to present different views on the legalization of raw milk, including representatives from the county's public health department -- which remains steadfast against the idea. "Based on the scientific evidence that's out there, I fail to see how the benefits outweigh the risks," said Susan Buckley, director of the county public health branch of Health and Human Services, by phone earlier this week. Numerous entities oppose consumption of raw milk, including the U.S. Department of Agriculture, the federal Food and Drug Administration and the American Academy of Pediatrics. "Raw milk is inherently dangerous and may contain a whole host of pathogens ...," said John F. Sheehan, with the FDA, in testimony before the House Agriculture Committee in 2009. "Raw milk should not be consumed by anyone, at any time, for any reason." Buckley said that before the advent of milk pasteurization, in 1932, 25 percent of foodborne illnesses were attributed to milk products. "And between 1998 and 2008, nationally there were 85 outbreaks of human infections due to raw milk, that were reported to the Centers for Disease Control," Buckley said. "There were 1,164 illnesses, 187 hospitalizations and two deaths." A couple of years ago, several Del Norte County people became sick from bacteria in raw milk; one young woman ended up paralyzed. This is the sort of scary talk that raw milk believers hate. Hunter, and others, say raw milk from cows that feed only on green grass and don't stand around all day in manure piles, like conventional dairy cows do, can be safer than pasteurized milk (a claim refuted by non-believer scientists). They also point out that most of the counties in California allow the sale of raw milk (they claim Humboldt's the only one that doesn't, but King and Trinity counties also ban its sale, according to Neely). Hunter, who's 61, became a raw-milk devotee a few years after she moved to Humboldt County. She went to a potluck at Democracy Unlimited's "Duck House," at which the Weston A. Price Foundation offered a presentation on its "Campaign for Real (raw) Milk." There, Hunter met several people who sell raw milk locally, and got her first taste of the stuff. She started buying raw cow milk from local, small-time producers. Then she bought raw milk from Organic Pastures Dairy in Fresno County, where it's legal to produce and sell raw milk. It was $10 a gallon, but shipping costs made it about the same price as the local black-market stuff. Plus, Hunter said, she prefers the Humboldt-produced milk better than that from the dry clime of Fresno. So now she buys it from the local folks again, in particular from one producer who owns one cow. Ironically, that person -- we'll call her Becky so she doesn't get busted -- said last week that she probably would still have to sell her raw milk under the radar because, with just one cow and a kitchen-based operation, the milk inspector would just laugh at her. "I'm too micro," she said. But, she added, in her production she assiduously follows the cleanliness guidelines that legal producers must abide by. At the two upcoming rallies, Mark McAfee, founder and owner of Organic Pastures Dairy, will talk about the physiology of raw milk. His company is the only raw milk dairy approved by the State of California to sell to retailers, in counties where that's allowed. "We have to meet and exceed the pasteurized milk standards," he said by phone last week. McAfee also ships raw milk, legally, to individuals who can't get it in their county; he has about 35 Humboldt customers. He says, overall, his company grew 17 percent last year. "When you have people that lose their medical insurance, that's when they really start worrying about preventing disease," he said. And that's the kind of talk that scares some health providers. "I would recommend that folks would consider the risks before drinking raw milk," Buckley said. "And it's worth mentioning that our greatest concern is for the more vulnerable populations: children, elderly, the immunocompromised." Confusingly, those are the very folks whom many raw-milk believers say can benefit from drinking the stuff. For more fun and enlightenment on this, check out that board meeting in August.